This program is geared to preschoolers of all aspects. Preschool programs include Mom and Tots, Super Tots, and general Preschool classes. This program is geared to preschoolers of all aspects. Preschool program includes: mom and tot, preschool, and supertot. This is a full gymnastics program for boys and girls ages 18 months - 5 yrs. old. Balance beam, Horizontal bar, Tumbling, Trampoline, Tumble Track and Vault are all experienced within this classes as well as developing coordination, body awareness, self confidence and social skills. Although emphasis is on having “fun”, this is a skill class and not a playground. The preschool program includes: Tiny Tots, Sparklers, and Super Tots. Movement education is offered to ages 18 months to 3 years of age. Within this program your toddler will be introduced to various gymnastics equipment and skills including gross motor, balance, hand/eye coordination. In addition the class will concentrate on building confidence and self-esteem, but most of all on having fun. *Parental Assistance is required for this program. 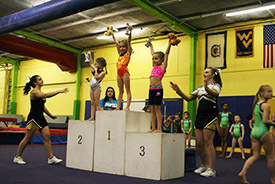 This is full gymnastics program for boys and girls ages 3 to 4 years of age. Balance beam, Horizontal bar, Tumbling, Trampoline, Tumble Track and Vault are all experienced within this classes as well as developing coordination, body awareness, self confidence and social skills. Although emphasis is on having “fun…” This is a skill class and not a playground. A class designed for our older preschool age children with higher level of comprehantion, strength, coordination and flexibility. While children in the Super Tot program will be working on more difficult skill progressions then the regular preschool class, the emphasis is still on having fun. Students will be chosen for the Super Tot class by Gym Nest coaches. This class has specialized, age-appropriate skill training for children ages 4 1/2 - 5 1/2.